If you know Kaitie Jowers, then you know how bittersweet it is that her time at Sorenson Impact recently came to an end. Kaitie officially left the Center in July of 2018 to attend law school at Georgetown University. Although everyone will miss her greatly, we’re excited for her to pursue her dreams. We’re also very appreciative of everything she did for the Center. Here’s a glimpse at some of the incredible things she did in her time at Sorenson Impact, and a chance to get to know Kaitie a little bit better. 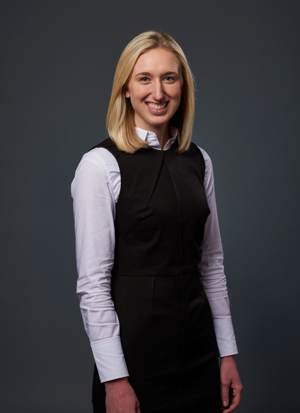 While earning her bachelor’s degree in political science from the University of Utah, she was involved with the Hinckley Institute of Politics where she had many incredible opportunities, such as working on the Malian presidential campaign of BYU Alumnus Yeah Samake. She helped to fundraise and promote his campaign on social media. An exciting highlight of Sorenson Impact is the Winter Innovation Summit. Every year, the Center puts on an impressive conference that brings hundreds of people together from a wide spectrum of fields for a multi-day event. Approximately 700 people come to the Summit each year, which creates the perfect environment for networking and idea exchange. Putting something of this magnitude together is a daunting, intimidating task, but it’s one that Kaitie handled in phenomenal fashion. As co-manager of the summit one year, and manager the next, Kaitie was in charge of running the Summit and making sure everything went smoothly. The Winter Innovation Summit is a spectacular conference that facilitates education and growth in many social impact fields, and it wouldn’t be possible without incredible people like Kaitie. The best way to understand Kaitie and what working at Sorenson has meant to and done for her is to listen to her talk about the changes she’s seen in herself throughout her time here. Challenging the status quo, looking for new and better ways to do things, and being willing to deviate from tradition in order to help those in need are fundamental principles at Sorenson Impact. It’s clear when talking to the talented people that work there, like Kaitie, that those values become a part of everyone involved with this incredible social impact movement. What Does It Mean to Be an Impact Fellow?